Accessible by gondola, the “cinematic installation” tunnels into the permafrost below the Ice-Q restaurant that stood in as the Hoffler Clinic—the workplace of Bond Girl Madeleine Swann—in the 2015 film Spectre. The tech lab is a must-see for the classic Bond-style gadgetry within. 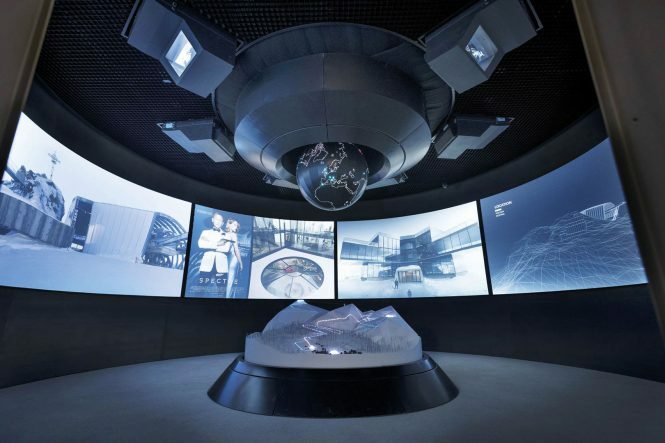 James Bond aficionados headed to Austria’s Tyrolean Alps should make a beeline for the brand-new 007 Elements in Sölden, located at the 3,058-meter summit of Gaislachkogl Mountain. Its high-tech galleries delve into the special effects and stunts used in that movie’s Alpine action sequences, with plenty of nods to earlier films in the franchise. The tech lab is a must-see for the classic Bond-style gadgetry within: think Scaramanga’s golden gun and the ski-pole rifle used by Roger Moore in The Spy Who Loved Me. This article originally appeared in the August/September 2018 print issue of DestinAsian magazine (“Licence to Thrill”).